It was time for a photo shoot, the twilight that hampered Summer nights was waning and now dark skies have returned for a new season of night sky photo shoots. I had been feeling the urge all day and by afternoon I was in two minds if I should or not. What got me interested was that a good clear night was in store however the weather would go down hill on Wednesday for the rest of the week so this was motivation enough and there was also a slight chance of a G1 geomagnetic storm due to a fast moving solar wind stream, I had a feeling the aurora wasn't going to happen and the NOOA forecast did address the fact that this stream could pass south of the Earth and miss completely, however the risk itself would be further motivation to head out. 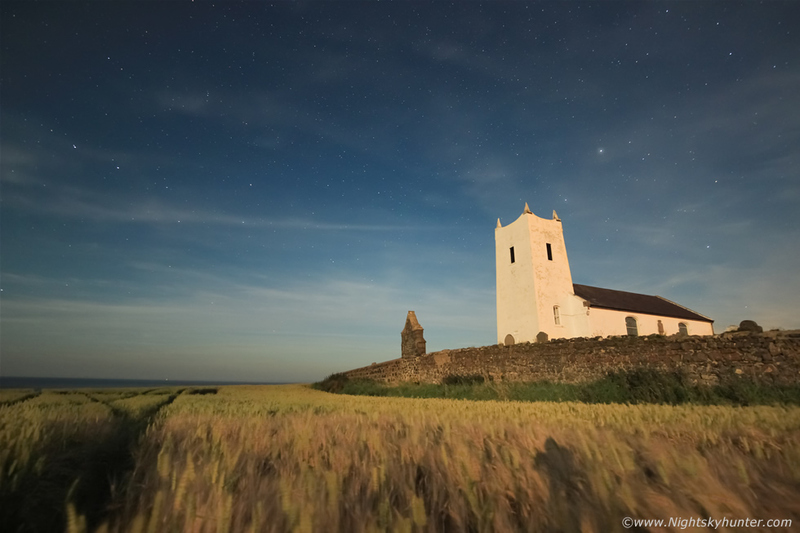 The moon would be bright at waxing gibbous phase and only two days from full however its light would be perfect for illuminating foreground for dramatic night landscape photography, I was really in the mood for this and shooting a star trail and I was thinking about the north coast and quite possible Ballintoy church. 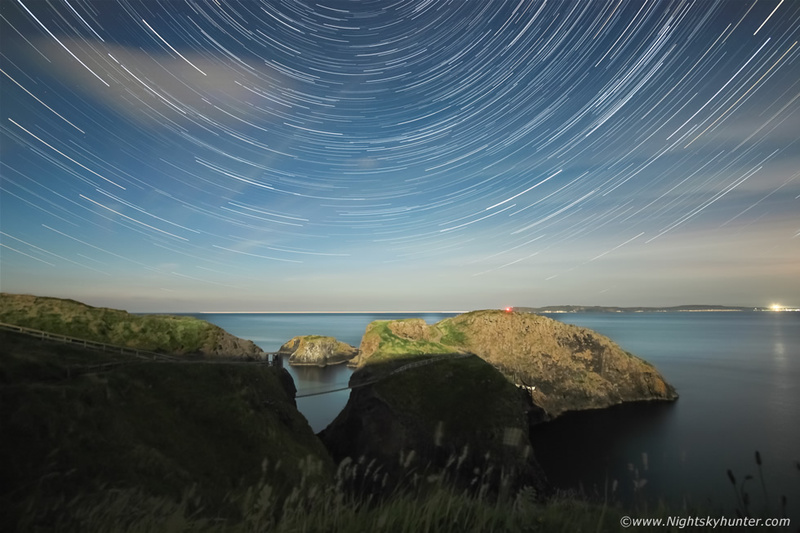 I was soon in contact with Dungannon photographer John Fagan and much to my delight John had been thinking the very same thing, he was in the mood for a shoot at the coast, star trails, Ballintoy and even brought up Carrick-a-Reed rope bridge which was a place we had discussed in the past so we decided tonight would be a good night to test it out and see if it had potential so plans were quickly made and we had arranged to meet early at 20.30 BST when there would still be daylight for we figured we might as well shoot the sunset too. I packed a lunch, filled a flask, dressed appropriately and packed my camera gear and the drone into the van, I figured if I arrived in time I might get a chance to film the church from the air. Before I left there was a beautiful formation of lenticular wave clouds in the western sky near Maghera surrounded by blue skies and in the east I could already see the rising moon, it seemed full of mystery and wonder about what lay ahead. I left a little early and with the exception of getting held up by slow drivers and tractors the going went well and I arrived at Ballintoy at 20.00 BST. I quickly got set up in a barley field surrounding the old church and did two drone flights over the fields and around the church itself, the light was gorgeous during golden hour with the fields lit into wonderful warm light by the setting sun. I also bumped into photographer David Laverty who I had never met before and we had a nice chat about flying RC planes, drones and the beautiful evening we had been rewarded with for a photo shoot. I landed the drone, packed it away, went back to the van and attached the 100-400mm lens to the DSLR and walked along the church path and into the graveyard. A stunning sunset greeted me when I walked around the corner, I leaned on an ancient head stone and began taking stills. 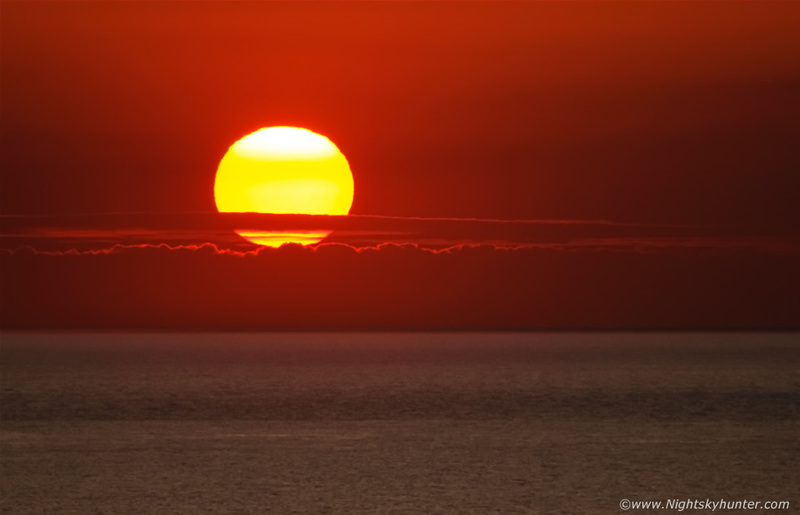 The solar disk was large and easy to see with the naked eye as it hung in the sky close to the flat ocean horizon, it was without question the nicest sunset I had seen this year to date. The disk is yellow in these images however visually the sun was a mesmerizing red oblong with the limb bent and distorted by atmospheric extinction. 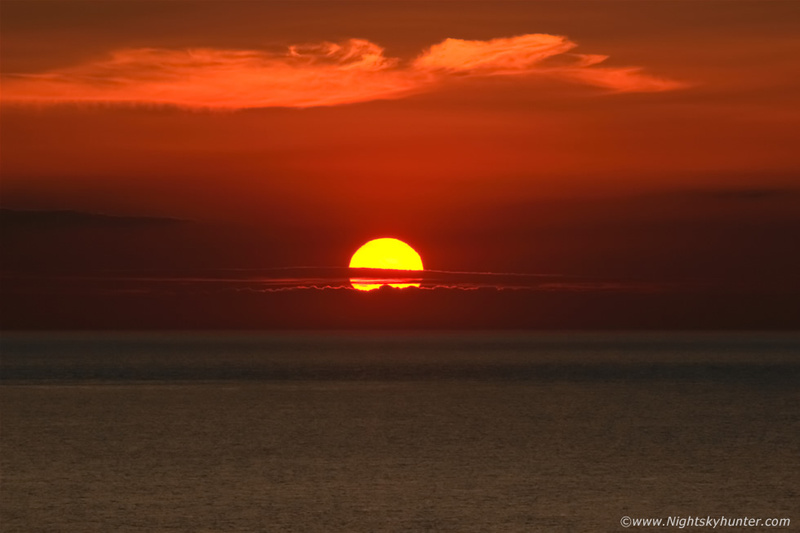 The disk then sank slowly into a bed of haze and vanished along the horizon and blended in with the ocean like some fiery submarine. I glanced behind me and there was a lady sitting on a stone ledge next to the church who had also been watching the sunset, I knew she was there and had sensed her presence for some time however up until this point I had been busy taking images and focusing on what I was doing so I was grateful she didn't disturb me until I had finished. The lady and I ended up having a pleasant chat about astronomy and weather and about her husband who had been a pilot during who had witnessed the famous Bovedy daylight fireball event which dropped meteorites over N. Ireland, a fragment of which fell through a roof and onto a desk at a police station. While this conversation was going on the sky in front of us was breathtaking with wisps of pink and red cirrus clouds and flat lenticulars against the dusk blue and all reflecting upon the sea. We were then joined by mountain climbing legend Derek Watters then John Fagan arrived and all of us chatted away about the night sky, thunderstorms, winter weather and mountain climbing, as the dusk sky darkened and the first stars and planets came into view we parted ways then John and I hit the road for our first location of the night. John and I made it to Carrick-a-Reed and hiked along the path to get an angle on the famous rope bridge which connected two islands on the sea and where thousands of tourists would have paid a fee to walk across it's high wooden planks on an almost daily bases for years. It was quite a walk when carrying all the camera gear however we immediately fell in love with the place, it was quite, remote, no annoying people about and our view faced across the sky to the NE, N and NW opening up a large sky in front of us which had fantastic potential. The moon was behind us however because the ecliptic was low at this time of year it's highest position was still rather low in the sky with its light blocked by a mountain however some of the light made it through and we got a variety of islands and ocean lit by it's sublime glow. This is a star trail shot for approximately one hour at 10mm F/2.8 at ISO800 and 20 second exposures. You can see the rope bridge suspended in the shadows with Rathlin Island in the distance and the trail of a bulk carrier ship moving across the horizon. We had wonderful time here chatting about life and photography in complete harmony while the cameras clicked away. Once our first trail was done we followed a path onto higher ground which presented us with a majestic view across the sea so we decided to set up the cameras again and began a second star trail. John and I both commented that we had never seen the sea so calm before at night, normally when we are doing these photo shoots the night is windy and there were waves of some sort with the sea crashing against shore and making a constant rumbling sound, however tonight we couldn't hear the ocean at all, this and the moonlit shore made the moment all the more magical. You can see the glitter paths of both light house beams on the sea, also check out the curved rock formations/Islands, I was thinking that from above this would look like a hook echo on a radar image of a tornadic supercell, or maybe I'm simply obsessed with storms. When the shoot was over we did the steep exhausting walk back to the vans and had a well deserved brew then we drove back around to Ballintoy church to see what was happening. At this stage of the night the moon had lowered and the sky was a little darker with more stars visible so John and I made our way through the tall barely field with camera and tripod held high, for some reason it reminded me of solider's with M16s walking through the tall grass fields in a Vietnam movie. We followed the trails then found our positions inside this sea of barley and began taking exposures. The moon lit the field up bright and in the final exposures it looked almost like daylight with rich colours, we were liking what we saw and got relaxed and drifted into the zone. I began shooting a star trail, same settings as before except now 25 seconds to accommodate the slightly darker sky. The camera was perched high on the tripod dong it's thing while I hunkered down in the trail, I was immediately surrounded by crops and from inside it was dark, warm and very cosy, I could have fallen asleep here. Behind me, unseen and hidden in the darkness was John doing the same thing, I couldn't see him at all however we talked to each other quietly from inside this vast field. I smiled with delight, this moment was surreal, earlier in the day I never would have thought that I would be doing photography from inside a barely field at 02.00 in the morning. 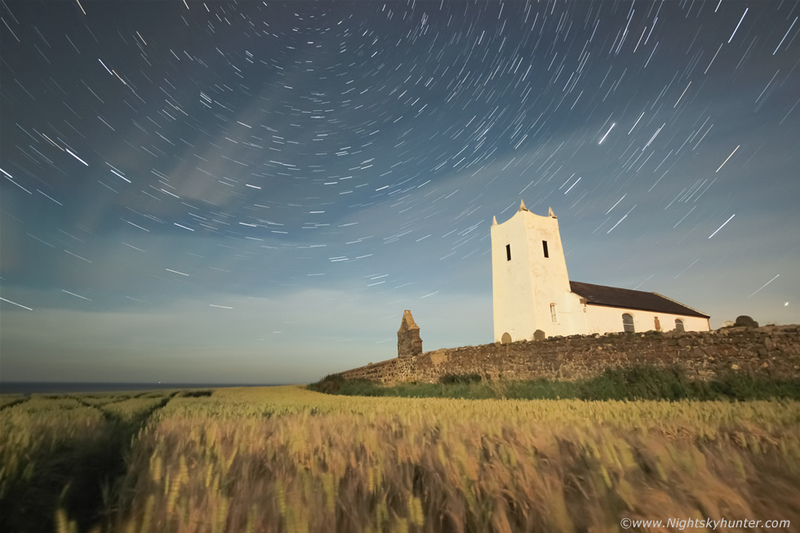 Moonlight shone on the barely tops and as I looked up I saw the famous church tower surrounded by circumpolar stars aloft while across the zenith the Summer Triangle shone proud. John went his way and I went mine, I followed the trail and ended up on the other side of the field and I felt like I was walking in slow motion like some kind of living dream. 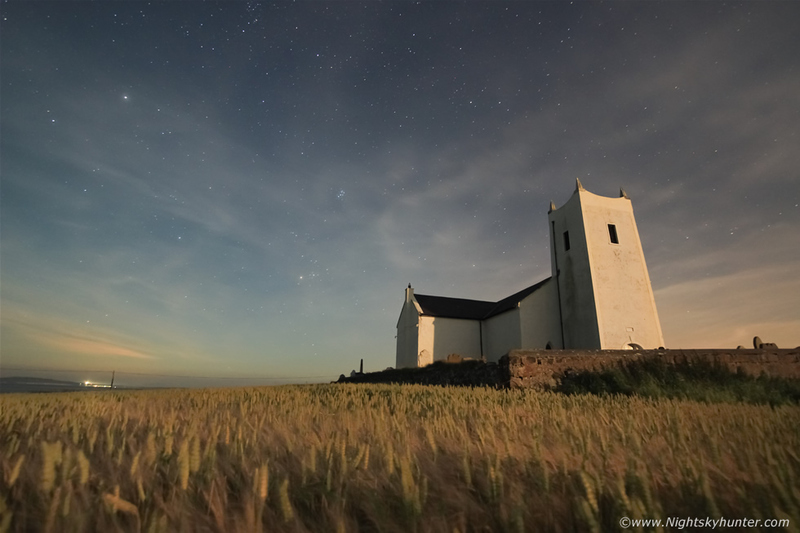 Here's the church with moonlit barely in the company of the Pleiades and Hyades. I decided to shoot into the moonlight for a change and I'm glad I did. The light was sublime, you would think at a first glance that this was a sunset however notice all the stars in the sky, this was near moonset when the light from the lowering moon was changing into a warm colour in the same fashion as the sun does when it moves into thicker atmosphere above the horizon. The moonlight was golden and it was catching the top of the barely. 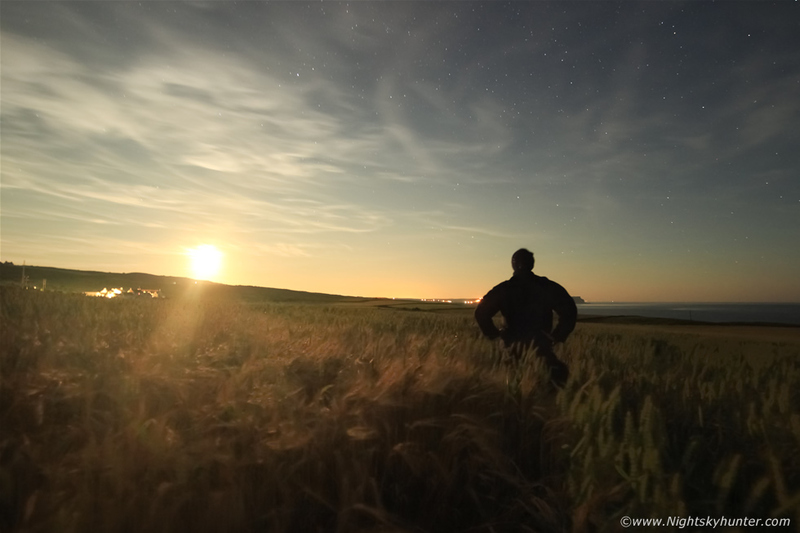 I don't normally do selfies and I actually detest the modern day term, I have always preferred to call these scenes memory shots, so I decided this night was worthy of such an image so here's me in the moment loving being surrounded by nature and under the stars with the golden moonlit barley crop making this night feel like I was living a dream. We called it a night and as we were driving home the setting moon looked remarkable, through my windscreen I could see John's van in front, dark trees and this massive orange-red moon seemingly hanging over the roof before it vanished in the darkness, the moon seemed so close I felt I could have touched it, John would also comment on this amazing moon sighting which made for the perfect ending for the perfect night from sunset to moonset, I was back at home for 04.00 then asleep for 05.00. 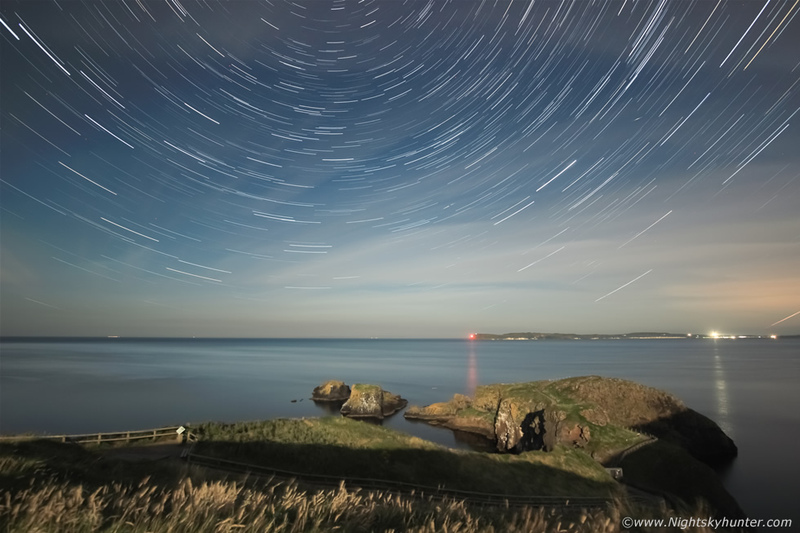 Two short DSLR time lapse sequences of Carrick-a-Reed rope bridge in moonlight using the same frames which were captured for the star trail at 10mm wide angle. 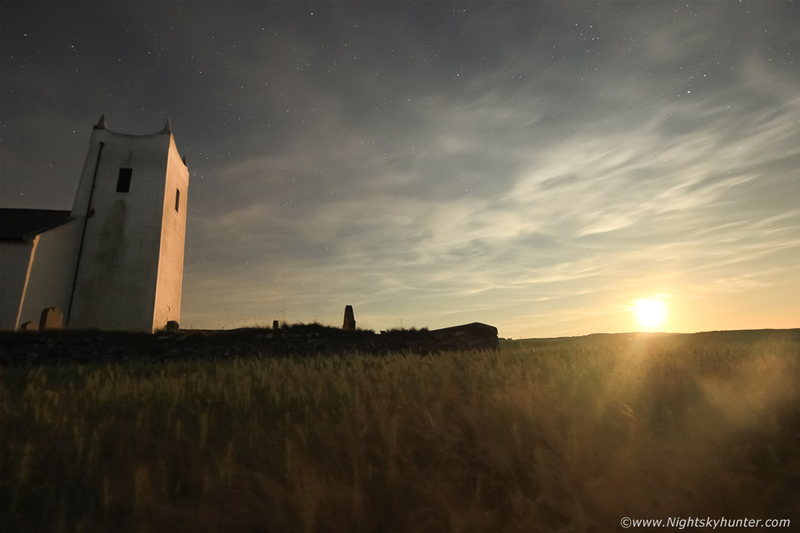 Drone footage of Ballintoy church during golden hour, this was a combination of two flights involving low and high passes and wraps around the church and over the barely field, best watched at 1080p, thanks very much for reading.